Simple, fast and super flexible task management solution to deliver project success. Our simple dashboard gives you a clear overview on what to work on today, what's up next and on which tasks you should keep an extra eye. No endless lists of tasks, just focus on the imprtant things. Prefer the common list- view, Kanban-layout or a boxed layout? No problem – blitz.pm can switch between three different layout variants within a second. 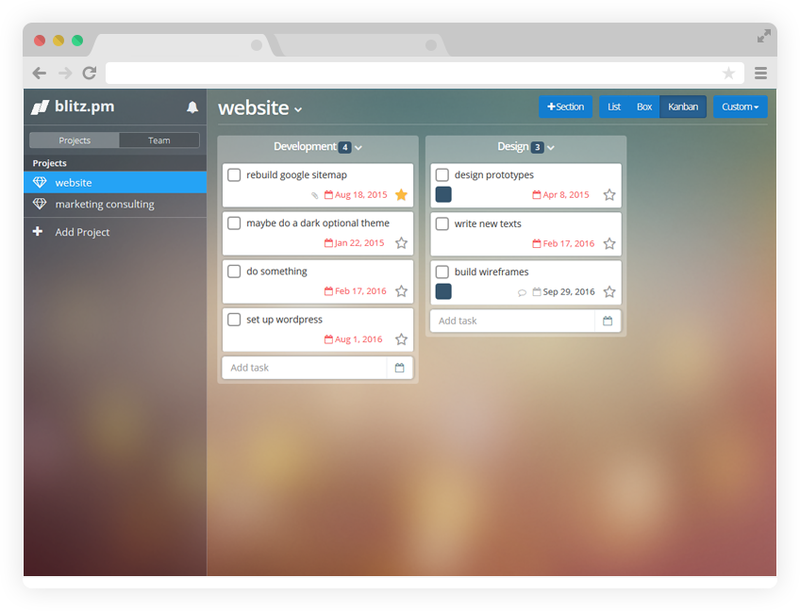 Equipped with a simple and intuitive drag&drop interface it has never been easier to manage your projects. No compromise to take – simple and powerful in one application. Breaking down projects and structuring your work has never been easier. 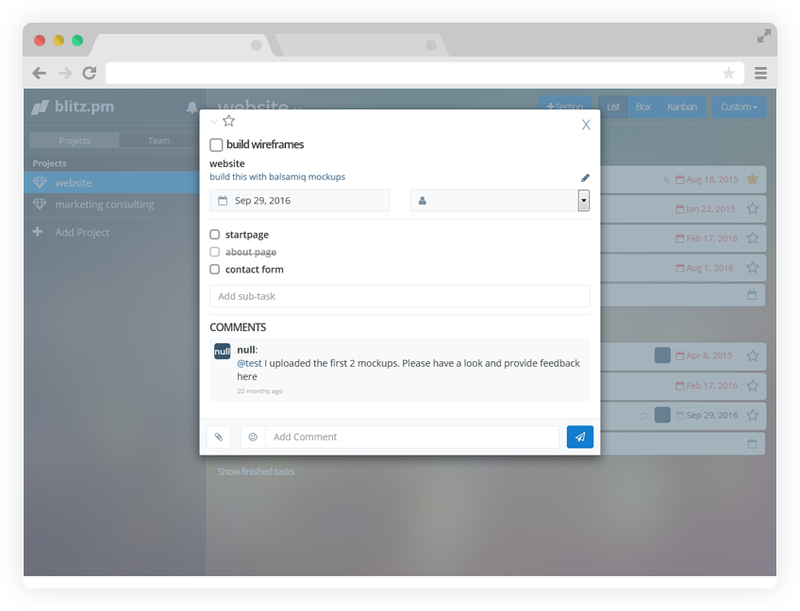 Powerful task tools like subtasks, duedates, notes, file uploads and comments help you to be more productive. Simple and beautiful design delivered for everyone – choose from various visual design options. Work in a team and work in collaboration in real time on your projects with the flexibility of choosing a project layout. Whether you prefer lists boxes (Eisenhower Matrix or custom flows) or a fully customizable Kanban layout – you can decide on a project base which layout to use. Duedates and smart grouping of tasks makes your life easier. Markdown formating and emojis can be used for enhanced communication with your team. 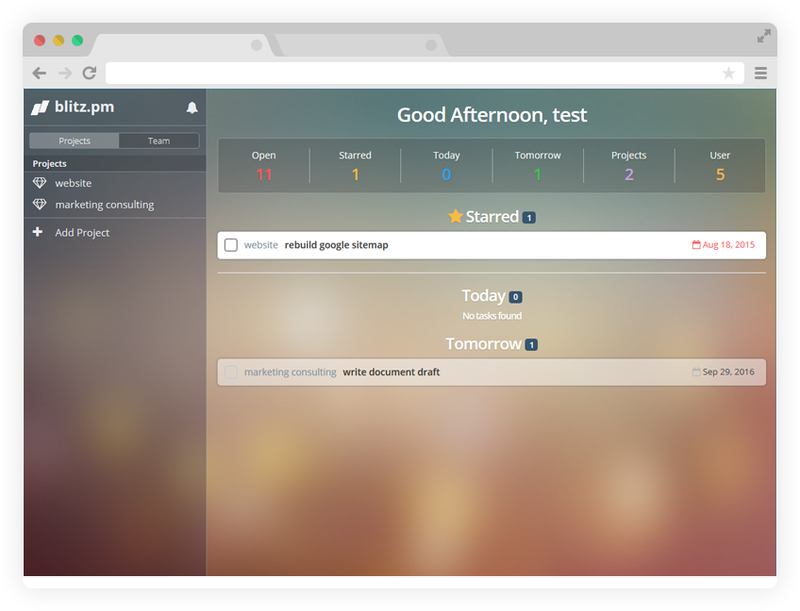 Distraction free dashboard with your current work. File management and included data storage for your project documents. Never miss a thing again with our in app and email notifications. Simple invitation and team management tools to work super-efficient together. Need clarification on a task? No problem –chat with your team to drive progress. Integrated with other popular cloud services like dropbox and box.net. Mobile first approach and upcoming apps to work wherever, whenever you are.